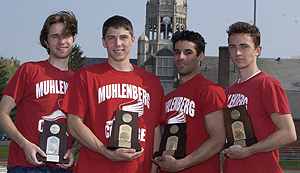 The 2002-03 school year was another good one for the Muhlenberg athletics program. Mule teams combined for a 128-74-1 (.633) record in Centennial Conference contests. Two teams won or shared CC championships, two others won regular-season or division titles, and six others finished second either in the CC regular season or in the CC postseason. Muhlenberg sent participants to the NCAA Championships in six sports and had seven athletes earn All-America honors. One student-athlete earned a prestigious NCAA Postgraduate Scholarship, and eight received Academic All-District honors. Away from the field of competition, there was a big change in the Mule athletic department when Steve Erber resigned in March after more than six years as athletic director. A national search is underway for a replacement. In April, ground was broken for the expanded Life Sports Center. Construction has begun, and the project (see drawing at right) is scheduled to be completed in the fall of 2004. Below are some highlights of the 2002-03 year. Please check back with Mule Sports Daily during the summer for updates on the athletic director search and Life Sports Center construction, as well as any other news that comes along. Have a great summer! Muhlenbergs first NCAA Postgraduate Scholarship recipient since 1991 was senior David Vassilaros of the mens soccer team. Also a first-team Academic All-American, Vassilaros graduated with a major in economics in December. He was a first-team All-Centennial Conference forward for the Mule soccer team that went 13-8 in 2002, falling out of the CC playoffs on penalty kicks. UMass.-Dartmouth came into its NCAA football playoff game at Muhlenberg with a 12-0 record and the top-ranked defense in Division III, but the Mules posted a resounding 55-6 win in their first NCAA game ever. Muhlenberg was eliminated in the round of 16 by John Carroll, but had a memorable season in which it tied the school record for wins (10) and shared its second straight CC title. Senior kicker Chris Reed was a first-team All-American, and senior quarterback Justin Jones was CC and ECAC Southwest player of the year. Haverford, which has won 14 consecutive conference championships in mens cross country, was pushed by Muhlenberg at the CC meet. The Mules finished second by only 11 points. Two weeks later, Muhlenberg missed qualifying its whole team for the NCAA Championships by just five points. Senior Will Elson and junior Rob Uniszkiewicz qualified as individuals and ran in the national meet. 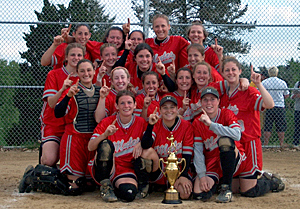 Laboring with a 1-12 record after the first 13 games of the 2003 season, the Muhlenberg softball team rebounded to capture its third CC title in four years. The Mules won three out of four games in the CC playoffs, coming from behind to defeat Gettysburg in the championship game, then went 2-2 at the NCAA East Regional. Eighth place was the best finish by a Muhlenberg wrestler at the NCAA Championships until senior Nate Yeasted finished seventh at 141 in 2003, becoming the Mules second All-American. Yeasted, who also shared the Chris Clifford Award as the senior with the most career success at the CC Tournament, ended his career with a record of 96-44. No Muhlenberg womens tennis player had won a conference singles title since 1988 until junior Gena Ross scored a 6-1, 6-0 win in the CC final against a Washington player. Ross won six sets 6-0 and two others 6-1 during the tournament, finishing her season with a 20-3 record. She also co-captained a Mule team that won its final 10 spring matches and received strong consideration for an NCAA Tournament bid. Brian Cash, Josh Cohen, Ben Phillips and Will Elson became the first All-Americans in the history of Muhlenberg indoor track and field when their distance-medley relay team finished fifth at the NCAA Championships. The foursome had the best time of the year in Division III. Elson, the Most Outstanding Performer at the CC Championships, added a second All-America honor when he took second place in the 1,500 meters. Elson concluded his tremendous year by finishing third in the 800 meters at the NCAA Championship meet for outdoor track and field. He matched his indoor honor by being named Most Outstanding Performer for track events at the CC Championships, and sophomore John Brodowski (a national qualifier in the decathlon) gave the Mules a rare double by earning the Most Outstanding Performer award for field events. Muhlenberg finished second at the CC Championships, tying its best finish at a conference track meet since 1944. Returning to Muhlenberg as a varsity sport for the first time since 1980, mens lacrosse won its first four games before running into the powerful CC. The Mules captured their season finale against Ursinus with an overtime thriller to end the year with a record of 5-7. Game-winning hits in the late innings by senior Ben Carr on back-to-back days put the Muhlenberg baseball team into the CC championship series for the second straight year. The Mules finished the season with a record of 21-14-1; their best winning percentage (.597) since 1976. Muhlenberg went into the third and final round of the CC Championships in mens golf tied for first place, but had to settle for second. Junior Jesse Neider tied for second with a 54-hole total of 231  the best ever by a Muhlenberg golfer at the CC meet. Unfortunately for the Muhlenberg womens basketball team, a change in names didnt result in a change of fortunes in the CC playoffs. For the second straight year, the Mules won the CC East Division title, but were defeated at home in the first round by McDaniel (known as Western Maryland in 2002). Muhlenberg ended the season with a 17-9 record that included six losses to nationally ranked and/or NCAA Tournament teams. Leaving a slow start behind, the Muhlenberg womens soccer team reeled off a nine-game winning streak to capture its third consecutive CC regular-season title. The Mules were defeated in the first round of the playoffs, however, to finish up with a 13-7 record. Junior Dawn Iberer became the programs all-time leader when she scored her 45th goal. Every game seemed to bring a new school record for the womens lacrosse team, which had it best season ever, finishing with an 8-7 record. Senior Lynsey Caldwell (36 assists) and freshman Courtney Tapkas (73 goals, 84 points) were among the most frequent record-breakers. Sophomore Kristen Bruschi broke 40-year-old school records for goals (19) and points (44), leading the Mule field hockey team to a school-record-tying 14 wins.